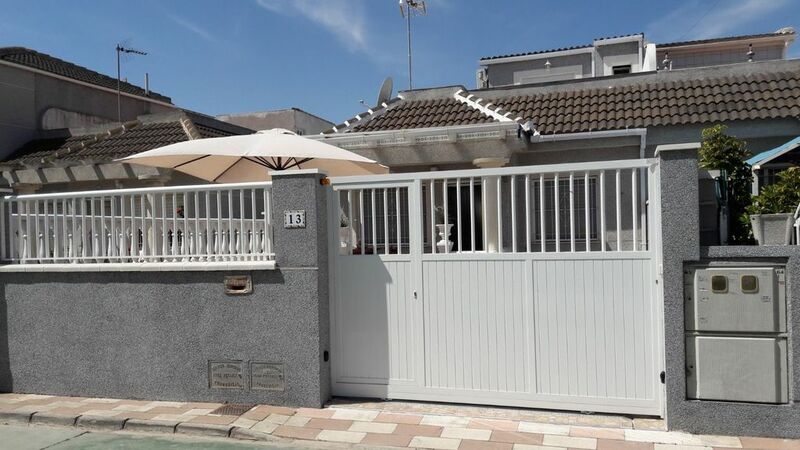 Set amidst a peaceful area ( "urbanization" Siesta, El Chaparral) 3 km from the center of Torrevieja, between its two famous salt lakes, next to the nature reserve of La Mata, our air-conditioned bungalow welcomes you for holidays. The bungalow is fully equipped to accommodate up to 6 people, summer and winter: 3 bedrooms (2 with double beds and 1 with 2 singles), 2 shower rooms, a kitchen and a large living room. Relax on one of two private terraces (equipped with chairs, tables and umbrellas) and enjoy your outdoor barbecues. Sunbeds available free on request. Nearby you will find a public swimming pool, car rental, restaurants, bars, pharmacies, supermarkets, shopping center, bus stops to the center of Torrevieja and its beaches. A water park for children is also available nearby (> 1 km). A car is necessary for sightseeing and getting to the beach (10 minutes drive), but the bus service is available with a stop at La Siesta. The center of Torrevieja is a 5 minute drive (or 15 minutes by bus). The rent includes water and electricity. A surcharge of EUR 50 is required for exit cleaning and a deposit of 300 EUR for a stay. Facilities: hair dryer, iron and ironing board, vacuum cleaner, air conditioning, linens provided, washing machine, dishwasher, coffee maker, toaster, microwave, oven, fridge, freezer, kettle, crockery & covered, television (French and Spanish channels), stereo, wifi, barbecue, deckchairs. We have just returned from a stay here and was very impressed with both the decor and the facillities that it offerd.The owners were more than helpfull and go out of there way to make you feel welcome. Its well located with bars and resterants nearby.We really enjoyed our stay. Huset var rent og pent. Alle tekniske hjelpemiddel fungerte bra. Hadde ønsket feks engelske tv-programmer, alt gikk på spansk/fransk. Speil kun på badet, hadde vært greit å ha et stort speil i stua. Hyller og kroker til oppheng var mangelvare. Upraktisk bad med dårlig lukt i andre etasje. Hylla over vasken burde flyttes bort. Kjøkken fungerte fint med bra komfyr, kjeler mm godt utstyrt. NB: ønske om flere kaffekopper (kun 6 stk). Uteplass og møblene var også bra. Stille og fredelig strøk. Bussene kjørte når det passet dem, fulgte ikke alltid rutetabellen. Thank your for your feedback and useful recommendations. Regarding the bad smell in the 2nd floor shower room, it is now solved. There is a full new evacuation. We hope seeing you again. Avons passé un super séjour dans cette maison très confortable. Nous remercions chaleureusement SONIA, JUSTINA et GREGORIO pour leur accueil, et nos bons échanges. L'endroit est très calme pour se reposer et voisinage très sympathique. Nous recommandons fortement cette location. Merci pour votre commentaire. Vous serez toujours les bienvenus dans notre maison. Vous êtes des locataires exemplaires. Nous sommes ravis d'avoir fait votre connaissance! Dit is een ideale vakantiewoning en zeker ook kindvriendelijk. Ook zeer vriendelijk onthaald door de eigenaars. In de buurt vind je ook een winkel, restaurant en een bar. Voor ieder wat wils en een mooie rustige omgeving. Hier is dit echt om in alle rust te genieten van je vakantie.. zeker een aanrader. The house is very modern and contains all you need. The family who owns the house is very friendly and helpful. There are sevaral nice restaurants within walking distance from the house. For us it was perfect to have the upper bedroom for our three teenagers (daughter and two friends). We are very pleased with our stay in this really nice house which is located in a nice area.